Close to moms house is a little farm, it has a few animals to pet and a few small shops so on a day when we had nothing planned we popped by. 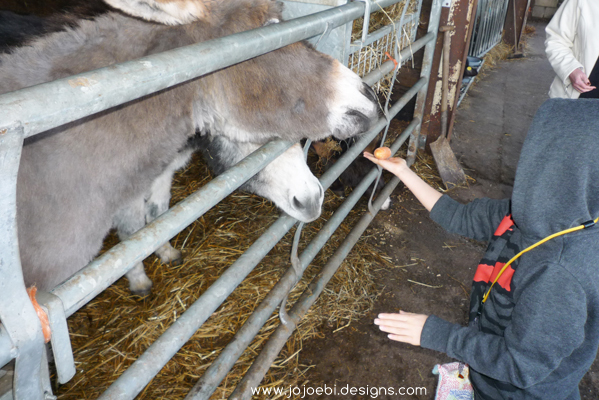 The farm is onto a good thing, they sell you bags of food so you can feed their animals! I grew up next to a farm and feel totally at home surrounded by animals but Ebi-kun gets a bit nervous, it took this poor donkey several attempts to get the carrot. We dropped lucky, we just happened to be there when they were bringing in Toby the pony, Ebi-kun knows that I have always been able to ride, I had a pony, similar size to this one when I was just 18 months old and I can't actually remember learning to ride, just as I can't remember learning to walk. 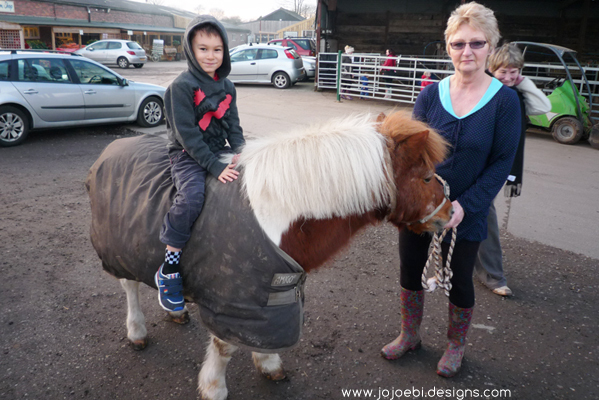 Anyway, we had hoped to visit a friend who has ponies but it basically rained the whole time we were in the UK but as we were patting Toby the owner asked Ebi-kun if he wanted to ride him into the stable, of course he said yes. He had no saddle or bridle, just a head collar and Ebi-kun had no helmet, this didn't even cross my mind as being dangerous, it is how I grew up. The funny bit was when the pony got in the stable he decided to have a roll in his fresh straw, luckily the handler grabbed Ebi-kun before he got squashed! It all added to the excitement and Ebi-kun couldn't wait to tell daddy about it all. It was a shame the weather was so crappy, I would have loved to have given him a proper lesson or two. Where is this? I am always looking for day trips around the UK when we are visiting our family. this is in Congleton, I would say it would make a day out, maybe a good way to kill an hour or two to get out of the house! wow! I can't remember the name of the farm but it is just behind Astbury Church.